Firstly, it isn’t clear that these emails contain evidence of any wrongdoing. Secondly, it hasn’t been established whether the documents are all genuine and unaltered. Thirdly, and most importantly, the consensus on anthropogenic climate change is bigger than any one specific institution. It is based on multiple lines of evidence that support the same conclusions – something that cannot be said about alternative hypotheses, such as that nothing is happening or that observed warming is not mostly being caused by greenhouse gasses. That said, you can be sure that climate change delayers and deniers will be milking these emails for years – using them to continue to cast doubt on the strength of the scientific consensus about climate change. Thankfully, it does seem as though the world’s political elites are increasingly aware of the strength of the scientific consensus and the incoherence of the views of those who deny it. [Update: 3 December 2009] Nature has posted an editorial about this whole incident. It makes reference to two open archives of online climate data – maintained by the IPCC (http://www.ipcc-data.org) and the US National Climatic Data Center (http://www.ncdc.noaa.gov/oa/ncdc.html). A scandal erupted in the world of climate science late last week after anonymous hackers posted years worth of selected private email correspondence between a handful of prominent climate scientists. The emails were stolen from a server at the University of East Anglia’s Climate Research Unit in Britain. Climate skeptics — those who either doubt the mainstream consensus that Earth has warmed during the past century or who doubt human influence is the primary cause of any warming — have seized upon the contents of the emails as evidence that mainstream climate scientists have been involved in a conspiracy to block those with alternative views from publishing papers in academic journals, in addition to other allegations. Although the personal emails do not provide any scientific evidence that would counter the scientific consensus that human emissions are altering the climate system, they are likely to be politically damaging, because they raise the appearance of impropriety in the scientific process. “The theft and use of the emails does reveal something interesting about the social context. It’s a symptom of something entirely new in the history of science: Aside from crackpots who complain that a conspiracy is suppressing their personal discoveries, we’ve never before seen a set of people accuse an entire community of scientists of deliberate deception and other professional malfeasance. Prominent voices on both sides of the climate change debate today called for an independent inquiry into claims of collusion between climate scientists after it emerged last week that hundreds of their emails and documents had been leaked that allegedly manipulated data and destroyed evidence for Freedom of Information Act requests. What makes it seem so to you? What are the elites doing now that they weren’t doing ten years ago which makes you think their beliefs have changed? You have to remain hopeful in one way or another. Troglodyte Republicans aside, most politicians now seem to find it convenient to say that they believe in climate change. Convincing them to support effective policies is a whole different story, of course. Just looking at the stream of crap on my facebook news page, I think you’re going to want to write a more comprehensive rebuttal to those decrying peer-review science as anti-skeptical, and as having hijacked science. Why not just point people at the RealClimate post an ensuing discussion? A huge amount of email from the East Anglia Climate Research Unit was hacked and released onto the web, causing much rejoicing from the climate change denialists. They read through the corpus of email and found that the scientists working on climate change often have substantive disagreements with one another, which they debate vigorously in email, and cited this as evidence of a conspiracy to cover up dissent and present a scientific consensus on climate change. Futurismic’s Tom Marcinko does a great job of putting this in context, rounding up several links to other good commentators around the web. In a nutshell: science is about the advancement of competing theories and the evaluation of these theories in light of evidence. The East Anglia Climate Research Unit’s scientists disagreed in some particulars, and used peer-review to resolve them (and continue to do so). No one is paying them to cover up evidence that climate change isn’t real or isn’t caused by humans — but they are conducting science the way that scientists do. “Whether they are right or wrong about the science, a researcher has a moral obligation to use ethical and legal means to try and prevent the publication or use of work that they sincerely believe to be false and endangers human well being. What are the elites doing now that they weren’t doing ten years ago which makes you think their beliefs have changed? One thing that seeems significant is that mainstream right-wing politicians no longer deny that climate change is happening. For instance, the Tories in both Canada and the UK say that they accept the science that the planet is warming due to human greenhouse gas emissions. There is a way to go before these parties will support effective policies, but this does seem like a mark of progress. In some ways, it is remarkable how effective status quo actors have been at blocking meaningful policies since then. Are you actually saying that a change in what Politicians say is evidence of a change in their beliefs? That is most politically naive, don’t you think? What politicians feel they have to say is significant. If those who might once have expressed skepticism no longer feel as though they can do so, it represents a shift in the scope of mainstream political discourse. Of course, politicians often say very different things to different audiences. What you say to environmental activists one day may differ substantially from what you say to the chamber of commerce or American Petroleum Institute the next. Politicians have to be slippery people to endure in their profession. That’s exactly why the limits of discourse are important. Everyone expects politicians to tailor their message to the audience they are speaking to. The kind of statements that go beyond what is ‘reasonable’ – and thus provoke outrage – are important markers for the overall state of debate on an issue. Obviously the limits of discourse are important – I agree with you entirely if you interpret your original claim in terms of public pressure determining what is possible to say in public, what is “truthy”. Now, the notion of “awareness” is not “what you say in public”, but what you actually believe. You then interpreted that belief to be belief about what the public will swallow. But in this original claim, the belief is specifically about the scientific consensus and the incoherence of denial. So, I ask again, do you believe the elites are more aware of climate change than they were ten years ago, or, are they simply more pressured into not lying about it in public? IS GLOBAL warming a trick? That is what some saw in a huge batch of e-mails and documents taken from the servers of the Climate Research Unit (CRU) at the University of East Anglia, in England, and put up anonymously on the web. The result has been a field day for those sceptical of the idea of man-made climate change, who have combed through them, pouncing and pronouncing on snippets that seem to show scientific malfeasance. The CRU specialises in studies of climates past. For parts of the past where there were no thermometers to consult, such studies use proxy data, such as tree rings. Reconstructions based on these tend to show that the planet’s temperature has risen over the 20th century to heights unprecedented for centuries and perhaps millennia. They are far from the only evidence for believing in climate change as a man-made problem, but they are important, and the sharp uptick they show has taken on iconic value. A tree-ring reconstruction known as the “hockey stick”, which shows unprecedented 20th-century warming, has been a particular target of criticism by sceptics. It was published in 1998 by Michael Mann (then at Yale, now at Pennsylvania State University) and his colleagues, and featured prominently in the 2001 report of the Intergovernmental Panel on Climate Change (IPCC). Hence the eagerness with which bloggers fell on one of the stolen e-mails, sent in 1999 by Phil Jones, the CRU’s director: “I’ve just completed Mike’s Nature trick of adding in the real temps to each series for the last 20 years (ie from 1981 onwards) and from 1961 for Keith’s to hide the decline.” Trickery associated with Dr Mann was catnip to the sceptics. But Dr Jones has clarified that “The word trick was used here colloquially as in a clever thing to do. It is ludicrous to suggest that it refers to anything untoward.” The “hiding” concerned the decision to leave out a set of tree-ring-growth data that had stopped reflecting local temperature changes. That alteration in growth pattern is strange, and unexplained, but eliminating it is not sinister. Sadly, discussing these things rationally in public is hard. As Judith Curry, a climatologist at the Georgia Institute of Technology, observes, attacks on climate scientists, sometimes paid for by carbon-emitting industries when global warming first became a public issue, have made many researchers in the field nervous and defensive. This does not excuse attempts to resist transparency, but does help explain them. Though such attacks have become rarer, there is now little presumption of good faith between global warming believers and sceptics, even independent ones, as an episode like this illustrates. Little wonder that the scientists are looking tribal and jumpy, and that sceptics have leapt so eagerly on such tiny scraps as proof of a conspiracy. 3) The Mainstream Media is covering this. They just might not be covering it the way you want, and that’s probably a good thing. The CRU holds one of the key global data sets on temperature, so its data has helped underpin the IPCC’s conclusions. This report contributed to the current political consensus on the need for cuts in greenhouse gases (although not yet on the extent of the cuts). A minority of sceptics who mistrust the evidence of recent warming are hoping their view will be corroborated by the inquiry into the stolen e-mails from CRU, in which some observers claim to see alleged signs of collusion among climate scientists. Other scientists tell me they doubt the inquiry will affect the main course of scientific opinion, as the CRU temperature data set is very similar to the two other global sets, both in the US. Professor Phil Jones, director of the Norwich-based University of East Anglia’s (UEA) Climatic Research Unit (CRU), has said he stands by his data. I think the independent review will probably confirm what RealClimate and others have been saying: that the emails do not seem to demonstrate any gross scientific misconduct, and they certainly do not disprove the hypothesis that humans are causing the climate to change. How vital to climate change hypotheses is the CRU data set? Stolen e-mails have revealed no scientific conspiracy, but do highlight ways in which climate researchers could be better supported in the face of public scrutiny. Denialists often maintain that these changes are just a symptom of natural climate variability. But when climate modellers test this assertion by running their simulations with greenhouse gases such as carbon dioxide held fixed, the results bear little resemblance to the observed warming. The strong implication is that increased greenhouse-gas emissions have played an important part in recent warming, meaning that curbing the world’s voracious appetite for carbon is essential (see pages 568 and 570). The United Nations will conduct its own investigation into e-mails leaked from a leading British climate science centre in addition to the probe by the University of East Anglia, a senior UN climate official said today. E-mails stolen from the climate unit at the University of East Anglia appeared to show some of world’s leading scientists discussing ways to shield data from public scrutiny and suppress others’ work. Those who deny the influence of man-made climate change have seized on the correspondence to argue that scientists have been conspiring to hide evidence about global warming. In an interview with BBC radio, the chairman of the Intergovernmental Panel on Climate Change, Rajendra Pachauri, said the issue raised by the e-mails was serious and said “we will look into it in detail. A short drive from the windswept North Sea coast of England, the Climatic Research Unit occupies a squat, weather-beaten grey concrete building on the campus of the University of East Anglia. This scientific bunker holds the world’s largest trove of climate-change data, gleaned from Siberian tree-ring counts, Greenland ice-layer measurements and centuries-old thermometer readings. Now the pirating of thousands of e-mail messages from within its walls has revealed a dangerous bunker mentality among the scientists who guarded those records and a data-fudging scandal that has created a crisis of confidence in global-warming science that is threatening to destroy the political consensus around next week’s carbon-policy summit in Copenhagen. The crisis intensified yesterday as the head of the UN’s Intergovernmental Panel on Climate Change, the main scientific and political authority on global warming, announced an investigation into the university’s practices and the reliability of the findings that have underpinned the UN’s climate-change conclusions. The university has launched its own inquiry and on Wednesday ordered the CRU’s embattled head, Phil Jones, to step down until it is complete. eldavojohn writes with an update to the CRU email leak story we’ve been following for the past two weeks. The peer-reviewed scientific journal Nature has published an article saying the emails do not demonstrate any sort of “scientific conspiracy,” and that the journal doesn’t intend to investigate earlier papers from CRU researchers without “substantive reasons for concern.” The article notes, “Whatever the e-mail authors may have said to one another in (supposed) privacy, however, what matters is how they acted. And the fact is that, in the end, neither they nor the IPCC suppressed anything: when the assessment report was published in 2007 it referenced and discussed both papers.” Reader lacaprup points out related news that a global warming skeptic plans to sue NASA under the Freedom of Information Act for failing to deliver climate data and correspondence of their own, which he thinks will be “highly damaging.” Meanwhile, a United Nations panel will be conducting its own investigation of the CRU emails. ClimateGate supposedly reveals a scientific world gone corrupt, but really shows a political world gone mad. The approximately 1,000 emails and 3,000 documents purportedly showed that an elite cabal of climatologists had massaged decades of data to fool the world into believing in the myth of anthropogenic climate change. (The perpetrators offered no explanation why the scientists might want to do this. My best guess: All climatologists secretly despise GDP growth.) The scientists had apparently altered the world’s biggest record of global surface temperature readings, trashed discordant evidence, and publicly humiliated climatologists who reached differing conclusions. Within a day, the story caught on across the Atlantic — particularly in the right-wing press. Blogger Matt Drudge banged the drum with headlines declaring a “climate cult.” Glenn Beck and other Fox News anchors devoted hours to the story. And on Thursday, two members of the Academy of Motion Picture Arts and Sciences (one the head of right-wing outfit Pajamas Media, which sent Joe the Plumber to cover the Middle East peace process) demanded that Al Gore — whose Oscar-winning documentary An Inconvenient Truth featured the work of some of the climatologists embroiled in the scandal — give his award back. VICTORIA – Over the last year, there have been two break-ins at Andrew Weaver’s University of Victoria office and several attempts to hack into the computer system. The intrusions came as no surprise to Weaver, Canada Research Chair on Climate Modelling and Analysis and a member of the Nobel-winning International Panel on Climate Change. Like other scientists working in the climate-change field, Weaver says they face a well-orchestrated campaign of harassment by global warming skeptics. AS POLITICIANS, policy wonks, businessmen, NGO types, hacks and hangers-on converge in Copenhagen for the forthcoming climate conference, a row over a set of e-mails from a previously obscure part of Britain’s University of East Anglia is becoming ever louder, if no more illuminating. Two weeks ago e-mails and other documents that had been leaked or hacked from the university’s Climatic Research Unit (CRU) were sent to various websites. Those with a longstanding opposition to action on climate change, from bloggers to members of the American Senate to the Saudi government, are touting the e-mails as a resource with which to derail the Copenhagen talks. CRU’s researchers use various techniques to reconstruct the temperatures of times past. Some of the reconstructions they have been party to have long been the subject of technical criticism, sometimes in peer-reviewed literature, more frequently on blogs, notably Climate Audit, an award-winning blog by Stephen McIntyre. The critics have made many attempts to get CRU to distribute the raw data and computer codes which its scientists work on. The e-mails and other documents read as though the researchers were obstructive in dealing with some of these requests, that some of the data they used were in poor shape, that they may have indulged in spin when presenting some results and that they really did not care for their critics. The head of the CRU, Phil Jones, has stepped aside while the university undertakes an enquiry apparently centred on how the files got out and on how they relate to freedom of information requests. On Friday December 4th Rajendra Pachauri, chair of the Intergovernmental Panel on Climate Change, said that the organisation would also hold some sort of an inquiry, perhaps looking at the scientific substance of the issues and the scientists’ approach to the IPCC. The IPCC bases its work on papers that have been published in the peer-reviewed scientific literature. In one e-mail Mr Jones talks of stopping a couple of papers that he holds in low esteem from being discussed in an IPCC report “even if we have to redefine what the peer-review literature is”. This does not look good, though it is worth noting that at least one of those papers was, in fact, included in the report. Other e-mails talk of trying to get editors at specific journals removed. A: To paraphrase Shakespeare, it’s sound and fury signifying nothing. I haven’t read all the e-mails, but the most recent one is more than 10 years old. These private exchanges between these scientists do not in any way cause any question about the scientific consensus. But the noise machine built by the climate deniers often seizes on what they can blow out of proportion, so they’ve thought this is a bigger deal than it is. These people are examining what they can or should do to deal with the P.R. dimensions of this, but where the scientific consensus is concerned, it’s completely unchanged. What we’re seeing is a set of changes worldwide that just make this discussion over 10-year-old e-mails kind of silly. The entire North Polar ice cap is disappearing before our very eyes. It’s been the size of the continental United States for the last 3 million years and now 40 percent is gone and the rest of it is going. The mountain glaciers are going. We’ve had record storms, droughts, fires, and floods. There is an air of unreality in debating these arcane points when the world is changing in such dramatic ways right in front of our eyes because of global warming. Shocked by the hacked emails? Wait till you see what the other side’s been up to. When you survey the trail of wreckage left by the climate emails crisis, three things become clear. The first is the tendency of those who claim to be the champions of climate science to minimise their importance. Those who have most to lose if the science is wrong have perversely sought to justify the secretive and chummy ethos that some of the emails reveal. If science is not transparent and accountable, it’s not science. I believe that all supporting data, codes and programmes should be made available as soon as an article is published in a peer-reviewed journal. That anyone should have to lodge a freedom of information request to obtain them is wrong. That the request should be turned down is worse. That a scientist suggests deleting material that might be covered by that request is unjustifiable. Everyone who values the scientific process should demand complete transparency, across all branches of science. The second observation is the tendency of those who don’t give a fig about science to maximise their importance. The denial industry, which has no interest in establishing the truth about global warming, insists that these emails (which concern three or four scientists and just one or two lines of evidence) destroy the entire canon of climate science. “The understanding of science as a social activity has changed quite radically in the last 50 years. The classic virtues of scientific objectivity, universality and disinterestedness can no longer be claimed to be automatically effective as the essential properties of scientific knowledge. Instead, warranted knowledge – knowledge that is authoritative, reliable and guaranteed on the basis of how it has been acquired – has become more sought after than the ideal of some ultimately true and objective knowledge. Warranted knowledge places great weight on ensuring that the authenticating roles of socially-agreed norms and practices in science are adequately fulfilled – what in other fields is called quality assurance. And science earns its status in society from strict adherence to such norms. For climate change, this may mean the adequate operation of professional peer review, the sharing of empirical data, the open acknowledgement of errors, and openness about one’s funders. Crucially, the idea of warranted knowledge also recognises that these internal norms and practices will change over time in response to external changes in political culture, science funding and communication technologies. In certain areas of research – and climate change is certainly one of these – the authenticating of scientific knowledge now demands two further things: an engagement with expertise outside the laboratory, and responsiveness to the natural scepticism and desire for scrutiny of an educated public. Oh, and here’s a really good video explanation. As it says, if two out of context fragments are the only evidence of ‘fiddling’ in thirteen years worth of emails, then the denial argument is really clutching at straws. The video explains the context in detail. Hacked e-mails show climate scientists in a bad light but don’t change scientific consensus on global warming. We find such claims to be far wide of the mark. The e-mails (which have been made available by an unidentified individual here) do show a few scientists talking frankly among themselves— sometimes being rude, dismissive, insular, or even behaving like jerks. Whether they show anything beyond that is still in doubt. There are two investigations underway, by the U.K.’s Met Office and East Anglia University, and the head of CRU, Phil Jones, has “stepped aside” until they are completed. However, many of the e-mails that are being held up as “smoking guns” have been misrepresented by global-warming skeptics eager to find evidence of a conspiracy. And even if they showed what the critics claim, there remains ample evidence that the earth in getting warmer. * The messages, which span 13 years, show a few scientists in a bad light, being rude or dismissive. An investigation is underway, but there’s still plenty of evidence that the earth is getting warmer and that humans are largely responsible. * Some critics say the e-mails negate the conclusions of a 2007 report by the Intergovernmental Panel on Climate Change, but the IPCC report relied on data from a large number of sources, of which CRU was only one. Oops – too much ‘balanced’ please forgive. There is no indication whatsoever of any problem with the CRU data. An independent study (by a molecular biologist it Italy, as it happens) came to the same conclusion using a somewhat different analysis. None of this should come as any surprise of course, since any serious errors would have been found and published already. It’s worth noting that the global average trend obtained by CRU for 1850-2005, as reported by the IPCC (http://www.ipcc.ch/pdf/assessment-report/ar4/wg1/ar4-wg1-chapter3.pdf), 0.47 0.54 degrees/century, is actually a bit lower (though not by a statistically significant amount) than we obtained on average with our random sampling of stations. UK scientists have thrown their weight behind global warming science with a statement signed by 1700 researchers in support of existing evidence and upholding the conclusion that global warming is unequivocal. The evidence and the science is extensive and comes from decades of painstaking and meticulous research, by many thousands of scientists across the world who adhere to the highest levels of professional integrity, reads the statement. The initiative is the scientific community’s response to the ongoing questioning of core climate science and methods, after private emails between researchers were stolen from the University of East Anglia. The statement was coordinated by the Met Office and gathered over 1700 signatures in four days. ‘This tremendous response affirms our confidence in the science, and reinforces the immediacy of the challenge and the critical nature of the discussions at Copenhagen,’ write Professor John Hirst and Professor Julia Slingo in a note released by the Met Office. I think they are a lot more aware. By and large, I don’t think politicians are science nerds. They become aware of scientific issues when they get a lot of public and media attention, and when they start to affect how people vote. One way or another, the world’s elites must now recognize that climate change is a major issue. Whether they are completely committed to fighting it or 100% determined to stopping those who are, it is no longer something that can be considered trivial or just a niche issue of concern to a few activists. That said, it is disappointing to see how far down the environment has been pushed on the average voter’s list of priorities by the world’s ongoing economic problems. “There is no doubt that the CRU e-mails are an embarrassment to climate science in general, and to paleoclimate in particular. I have read the “greatest hits”, and cringe along with everyone else at their content. But in my professional opinion, these e-mails reveal nothing more than brief, emotion-fueled remarks made in the face of unrelenting and often disingenuous attacks. Far more importantly, the conduct (questionable or not) of a handful of climate scientists in no way undermines the scientific support for anthropogenic global warming. The conclusions reached in the IPCC report do not critically depend on the work of these few scientists. A university unit involved in a row over stolen e-mails on climate research breached rules by withholding data, the Information Commissioner’s Office says. Officials said messages leaked in November showed that requests under the Freedom of Information Act were “not dealt with as they should have been”. The UK government’s chief scientist says his confidence in climate science remains unshaken despite allegations about the withholding of research data. Professor John Beddington told the BBC the fundamental science behind man-made global warming was “correct”. He said he was concerned that the debate on climate change was becoming artificially polarised. But he urged scientists to be more open about the uncertainty of predicting the rate of climate change. He was speaking in the light of reports that the University of East Anglia’s Climatic Research Unit had refused to hand over data for public scrutiny. The Information Commissioner’s Office said messages obtained by hackers in November showed that requests by climate change sceptics under the Freedom of Information Act were “not dealt with as they should have been” under the law. Climate secretary Ed Miliband broke his silence on the ongoing row about man-made climate change by declaring war on the ‘siren voices’ who denied global warming was real or man-made. Mr Miliband said the by the ‘climategate’ controversy that appeared to show that vital data was suppressed or manipulated by climate scientists, as well as the more recent revelation that the Intergorvernmental Panel on Climate Change (IPCC) had exaggerated claims about the melting of glaciers in the Himalayan mountains. ‘It’s right that there’s rigour applied to all the reports about climate change, but I think it would be wrong that when a mistake is made it’s somehow used to undermine the overwhelming picture that’s there,’ he told the Observer. He pointed to a wealth of research used to support the argument that climate change is man made – the physical effect of carbon dioxide in the atmosphere, CO2 concentrations and observed increases in temperatures. ‘There are a whole variety of people who are sceptical, but who they are is less important than what they are saying, and what they are saying is profoundly dangerous,’ he said. “Speaking to BBC Radio 4’s The World this Weekend, Mr Miliband acknowledged that recent revelations had been damaging, but said it would be “devastating for future generations” to misinterpret them. “Yes it was bad a mistake that was made, yes the IPCC needs to reform its procedures… so these kind of mistakes don’t happen again. The scientist at the centre of “climategate” says he contemplated killing himself after leaked e-mails were seized on by sceptics. He agreed it became his “David Kelly moment” – a reference to the scientist who killed himself in the aftermath of the “sexed up” Iraq intelligence dossier claims. The IPCC now has recanted the paragraph in question. Though the widely quoted claims were in print for nearly three years, the IPCC’s admission does indicate that scientific errors can be publicly identified and corrected. But the errors don’t end – or begin – with the IPCC report. A careful look shows a complex set of conflations and misquotations begun by some science journalists more than a decade ago, transmitted and compounded by members of the IPCC Working Group II writing team, and hopelessly muddled by hasty, confused press coverage. Dozens of articles and analyses of this situation, whether dashed-off blog posts or New York Times coverage, exhibit a curious consistency. Not a single article or analysis appears to include all relevant issues without introducing at least one substantial error. It’s as though the original documents contained a curse which has spread to infect every commentator and reporter. The curse seems to stem from not reading sources carefully (or at all), which, ironically, was the IPCC Working Group II’s central failing, and also a major issue in the documents that were the basis of the defective paragraph. The IPCC’s Himalayan glaciers mistake in the end can encourage stricter editing, closer scrutiny, and more transparency in the review process. In that case, the mistake will have served a valuable function. Increased attention to primary scientific literature may help avoid future errors and also serve as a reminder that the IPCC process often tends towards conservative statements. It’s also important to remember that the science is constantly being updated. Consider, for example, the recent finding that the IPCC models may have systematically overestimated the ability of the biosphere to grow in response to increased carbon. If this research proves right, the IPCC’s long-term temperature projections for the world may be a full degree Centigrade too low, and controversies now commanding headlines will recede into history. When the IPCC errs, it’s not always in the same direction. This makes me think that at least elements of the global elite are taking climate change way more seriously than populations in general or governments. “In any public discussion there are bounds which people who want to be thought of as having respectable ideas tend to stay between. This is most easily seen in health care debates. In the US, promotion of a National Health Service as in the UK or a single-payer system as in Canada is so far outside the bounds of normal health care politics, that these options are only ever brought up by ‘cranks’ (sigh). Meanwhile in the UK, discussions of health care delivery solutions outside of the NHS framework are never heard in the mainstream media. This limit on scope of the public debate has been called the Overton window. The window does not have to remain static. Pressure groups and politicians can try and shift the bounds deliberately, or sometimes they are shifted by events. That seems to have been the case in the climate discussion. Prior to the email hack at CRU there had long been a pretty widespread avoidance of ‘global warming is a hoax’ proponents in serious discussions on the subject. The sceptics that were interviewed tended to be the slightly more sensible kind – people who did actually realise that CO2 was a greenhouse gas for instance. But the GW hoaxers were generally derided, or used as punchlines for jokes. This is not because they didn’t exist and weren’t continually making baseless accusations against scientists (they did and they were), but rather that their claims were self-evidently ridiculous and therefore not worth airing. “For example, a week ago Phil Jones, the director of the Climatic Research Unit at the University of East Anglia, gave an interview to the BBC that was widely described as a debacle. The main reason was that the BBC reporter asked Mr Jones whether he would concede that global warming since 1995 has not been statistically significant. Mr Jones replied: “Yes, but only just,” and went on to note that there was a measured global warming of 0.12°C per decade since then, and that it tends to be harder to get statistical significance out of shorter time samples. Since I’ve advocated a more explicit use of the word “lie”, I’ll go ahead and follow my own advice: that Daily Mail headline is a lie. Phil Jones did not say there had been no global warming since 1995; he said the opposite. He said the world had been warming at 0.12°C per decade since 1995. However, over that time frame, he could not quite rule out at the traditional 95% confidence level that the warming since 1995 had not been a random fluke. The University of East Anglia’s climate scientists, and indeed the results of climate science in general, are OK. The practice and culture of climate science, and the procedures of the university, are not. That is the conclusion of a report on the “climategate” e-mails by the MPs on the Science and Technology Committee of Britain’s House of Commons, the first of three different reports on the subject expected over the next few months. 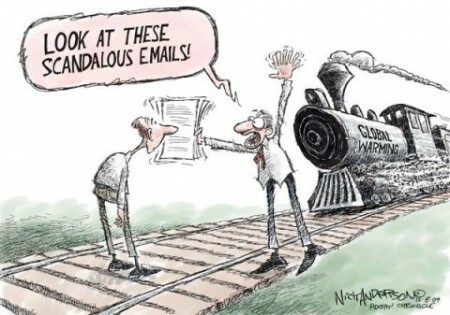 The e-mails, apparently stolen, have been seized on as evidence of various types of dishonesty and skulduggery in climate science since their release onto the internet late last year. The MPs’ most striking prescription is that climate science should hold itself, and be held to, a higher standard than heretofore when it comes to openness and transparency. When giving evidence to the committee, Phil Jones, the head of the UEA’s Climatic Research Unit (CRU), from which the e-mails came, said that freely disclosing data and the computer codes used to work with them “has not been standard practice” in the field. “If it is not standard practice how can the science progress?” asked Graham Stringer, a member of the committee. “Maybe it should be standard practice,” replied Dr Jones, “but it is not standard practice across the subject.” The MPs concluded that in a field as significant and important to policy as climate change this was not good enough. They are calling for data and methodological workings to be made openly available. On occasions when data are provided to scientists on the basis that they will not be further promulgated (as with some of the data Dr Jones used from meteorological agencies in other countries) that should be made clear, with all requests redirected to the relevant data-holders. A Dutch inquiry into the UN’s climate science panel has found “no errors that would undermine the main conclusions” on probable impacts of climate change. However, it says the Intergovernmental Panel on Climate Change (IPCC) should be more transparent in its workings. The Dutch parliament asked for the inquiry after two mistakes were identified in the IPCC’s 2007 report. The inquiry is the latest in a series that have largely backed “mainstream” climate science against detractors. The Netherlands Environmental Assessment Agency (PBL) does not give the panel a completely clean bill of health, however. Whereas the IPCC’s landmark Fourth Assessment (AR4) from 2007 “conclusively shows” that impacts of human-induced climate change are already tangible in many places around the world and will become more serious as temperatures increase, PBL also says the foundation for some of the specific projections “could have been made more transparent”. Climate scientists at a top UK research unit have emerged from an inquiry with their reputations for honesty intact but with a lack of openness criticised. The Independent Climate Change Email Review was set up by the University of East Anglia (UEA) after more than 1,000 e-mails were hacked from its servers. Climate “sceptics” claimed the e-mails showed that UEA scientists manipulated and suppressed key climate data. But these accusations are largely dismissed by the report. The review found nothing in the e-mails to undermine Intergovernmental Panel on Climate Change (IPCC) reports. An independent report into the leak of hundreds of e-mails from one of the world’s leading climate research centres on Wednesday largely vindicated the scientists involved, saying they acted honestly and that their research was reliable. But the panel of inquiry, led by former U.K. civil servant Muir Russell, did chide scientists at the University of East Anglia’s Climatic Research Unit for failing to share their data with critics. Cato scholars have been particularly energetic in promoting the Climategate scandal. Last year, private e-mails of climate scientists at the University of East Anglia, in England, were mysteriously leaked, and their exchanges appeared to suggest a willingness to falsify data in order to buttress the idea that global warming is real. In the two weeks after the e-mails went public, one Cato scholar gave more than twenty media interviews trumpeting the alleged scandal. But five independent inquiries have since exonerated the researchers, and nothing was found in their e-mails or data to discredit the scientific consensus on global warming. Nevertheless, the controversy succeeded in spreading skepticism about climate change. Even though the National Oceanic and Atmospheric Administration recently issued a report concluding that the evidence for global warming is unequivocal, more Americans are convinced than at any time since 1997 that scientists have exaggerated the seriousness of global warming. The Kochs promote this statistic on their company’s Web site but do not mention the role that their funding has played in fostering such doubt. A short piece for the general audience of RTR radio, Perth, Australia. Remember “climategate”? The private correspondence among scientists stolen exactly a year ago, which some columnists pronounced to be the (approximately 132nd) “final nail in the coffin” of global warming. Remember the “errors” in the IPCC report that hit the media a short time later? “Amazongate”, “Himalayagate”, and so on? What has happened to “climategate”? What’s happened is this. And in the U.S., two enquiries by his university cleared Professor Michael Mann, who published the first famous “hockey stick” graph, of all allegations. Sherwood Boehlert, the former Republican House member from New York , penned an op-ed in the Washington Post today taking members of his party to task for denying climate change. Boehlert represented New York’s 24th District in Congress from 1983 until he retired in 2007, and is now a special adviser to the Project on Climate Science. Climategate. Exactly one year ago, on November 17, 2009, email messages and other computer files were illegally stolen from computers located at the University of East Anglia’s Climatic Research Unit (CRU). These emails and files were then leaked to the Internet in a blatant attempt to derail international climate talks at the COP-15 Copenhagen Climate Conference. Two crimes were committed that day: 1) Emails were stolen and 2) Scientists were wrongly put on trial in the press and the blogosphere. These emails were spun by skeptics of man-made global warming as somehow proving that global warming is a hoax and that scientists were controlling what science gets published. Climategate was billed as the final nail in the coffin of anthropogenic [manmade] global warming (AGW). It doesn’t matter whether the hacked emails are valid or not. Al Gore’s use of affirming the consequent as a valid argument mode (it is not) discredited the entire Global Warming movement. Their constant use of the argument of pity (“species might die”, or “islands could sink into the sea”) to demand changes shows their ignorance of valid arguments and scientific debate. They just want want they want. The fact that they are using political methods and scare tactics, rather than scientific methods, shows that they are pushing a belief, not a fact. It almost seems to be a religious belief, the way they are behaving. They are working to silence anyone who doesn’t believe them. Affirming the consequent is not a fallacy in inductive logic. Inductive logic is verificationist – you make a hypothesis, and test for the results that you would expect. Every result you get which doesn’t falsify your data “affirms the consequent”. No particular piece of data proves you are correct, but if every piece of data fits your hypothesis, then the data fits your hypothesis. Of course this doesn’t prove your theory is true, but only in the sense that no theory can be proved to be true. Enough “affirming the consequent” proves any scientific theory to be true to a probability high enough to make serious decisions upon. “Pity” is a term for a moral intuition associated with Christian parternalism. Everyone hates “Pity”, because pity takes agency away from subjects. But by calling a genuine moral intuition – which we might talk about more generally as “you feel bad that you’re causing bad stuff to happen”, by the name “pity”, you are just serving to ridicule and sidestep a serious moral problem: that there is a high probability that our everyday lifestyles will cause huge damage to other peoples’ lives. Realizing this isn’t fun, it doesn’t feel nice. So, it’s not surprising that you want to dismiss moral feelings as “pity”. Not surprising, but not particularly deserving of approbation either. Do you really think there are scientists who don’t understand this? Hermetic seal? Is that another species going extinct? No, but seriously – if the ice all melts, that increases the amount of energy the arctic ocean will absorb. Which will warm the planet. Which may melt the tundra – which actually does need to be “hermetically sealed” in the frozen ground if we want the species to survive. Are you sure individual readings are terribly important? What would happen to the climate data if you took 1 sig. figure off of every temperature reading (rounding up and down, of course), and then re-did the averages. Would the average temperatures change much? At all? Has anyone tried this? Thanks for responding to some of that. In particular, thanks for dealing with the more philosophical objections. I will put up a few brief responses of my own, also. We have excellent scientific reasons for believing that climate change is a problem that human beings are causing by releasing greenhouse gases into the atmosphere. There is a ‘consilience of evidence’ when it comes to the science of climate change: multiple, independent lines of evidence converging on a single coherent account. These forms of evidence are both observational (temperature records, ice core samples, etc) and theoretical (thermodynamics, atmospheric physics, etc). Together, these lines of evidence provide a conceptual and scientific backing to the theory of climate change caused by human greenhouse gas emissions that is simply absent for alternative theories, such as that there is no change or that the change is caused by something different. Certainly, there is more than enough evidence to justify being worried and taking precautionary action. I don’t think people concerned about climate change are trying to inappropriately silence anybody. That being said, it is frustrating when they repeat discredited arguments over and over again, as is the case with your comment. This is just silly. Everyone knows that when floating ice melts, it doesn’t raise sea levels. Sea levels rise when water warms and expands, and when icesheets on land melt. No serious scientist thinks otherwise. I don’t know what you’re getting at here. Which ice do you think scientists think is trapping CO2? CO2 bubbles are definitely trapped in ice core samples, used to construct records of past climates. There is also the matter of methane clathrates. You need to be more specific before there can be any real response to this. If you don’t trust old thermometers, ignore them. We have lots of other sources of data on past temperatures. These include things like ice core samples, the distribution of pollen in lake sediments, and tree rings. By lining up a bunch of these indicators, we can construct fairly robust assessments of what the climate was like at different points. I think you are talking about the urban heat island effect here. It is real, but it doesn’t mean that climate change isn’t happening. Temperatures are rising globally, especially in the Arctic. That’s a well documented physical phenomenon, not an artifact that arose from the placement of weather stations. The Medieval Warm Period is another favourite of people who argue that we shouldn’t do anything about climate change. The regional climate in Europe may have been warmer then than during subsequent historical periods, but it was not an instance of global warming of the sort we are observing today. To take a bigger picture view, we know that greenhouse gases prevent infrared radiation from escaping into space. That means energy is trapped in the planetary system. That means the system warms. The chemistry and physics are very straightforward, and the consequences are worrisome. Climategate did not materially effect the outcome of Copenhagen. The reasons that the countries which met there could not agree had everything to do with diplomacy, politics and economics. They had absolutely nothing to do with what people in the room thought about the probity of a particular subset of climate science. What climategate changed was the response that came after. For those disappointed by the results, climategate provided a focus for displaced recrimination—something to blame. Doubt about climate change has regularly been helped along by concerted campaigns, and the climategate looked like more of the same. After all, no fraud had been found—but look! The media was all over it! And Copenhagen failed! Conspiracy! Then there were climate action’s fairweather friends. In general people don’t like to be associated with losers, and in Copenhagen the case for strong climate action spectacularly failed to get its preferred result. In this light, an increasing post-climategate tolerance for doubts about warming among the media and some politicians can be read, with just a little cynicism, as people making tactical use of climategate to distance themselves from an agenda they had once thought popular but which now looked increasingly lifeless. And what of those who were happy Copenhagen had failed? For them, climategate was a more comforting reason for that failure than the real ones. Copenhagen did not fail because governments didn’t want action on the climate, or even because no one is willing to take any action. It failed because they all wanted other countries to take more and different actions than the other countries would agree to. For people who don’t want there ever to be action, though, it is obviously happier to think that the case had been undermined by some dodgy emails than to recognise than that it still stood—and indeed still stands—but had simply failed to compel action. This reaction can be seen in its strongest form in American politics. For the Republican party, and for those voting for it, it is no longer necessary to argue about climate change. It has become acceptable to simply ignore it, professing some mixture of doubt, bafflement and apathy. Don’t we all know that the climate thing is over? But though this looks like a reaction to climategate, and to flaws in the products and processes of the Intergovernmental Panel on Climate Change, those factors are, again, the sizzle not the steak. At its heart this too is a response to Copenhagen, and the subsequent lack of momentum on climate action, and the administration’s inability to do anything about it. The case for action currently feels so weak that it can be held off with a flat palm of refusal-to-engage. Perceptions of climategate doubtless make that stance easier to hold. But they aren’t its underlying cause. Researchers at the U.S. National Oceanic and Atmospheric Administration have been cleared of any scientific wrongdoing in the 2009 “climategate” uproar. “We did not find any evidence that NOAA inappropriately manipulated data or failed to adhere to appropriate peer review procedures,” said the report by the U.S. Department of Commerce Inspector General late last week. It was the latest of several U.S. and U.K. probes into accusations, based on leaked emails, that climate data had been manipulated or deleted to support the theory that global warming is caused by human activity. The other investigations have also cleared the scientists of wrongdoing. More than 1,000 emails were stolen from the climate research unit at the University of East Anglia in Norwich and posted on the internet in November 2009, just before the big international climate change summit in Copenhagen. Among them were emails to and from scientists at NOAA, some of which discussed ways to stonewall skeptics of man-made climate change or freeze them out of peer-reviewed journals. The Inspector General launched its review after a request from Senator James Inhofe in May 2010. Inhofe has publicly expressed scepticism of climate change science. If an article has to use the word “alarmist” to prove its point, it demonstrates unreasonable, presumptive bias. Independent reviews of the so-called Climategate affair concluded there was no falsification of evidence by the researchers (Suppression Of Debate Is A Disaster For Science – Dec. 1). Meanwhile, a recent review (partially funded by a group that denied climate-warming science) of more than a billion pieces of data – five times the amount previously examined by anybody else – by Richard Muller, a Berkeley physicist who was skeptical about climate science, concluded that the consensus global warming conclusions, including the hockey stick model, are indeed supported by the evidence. The problem is not suppression of the debate, but is instead superficial and uninformed coverage of the science by the press.